In order to protect the interests of all of our users, as well as those of our information providers, we ask that you abide by the following rules. By registering as a user or by using BUSINESS OF MEDICAL PRACTICE com (the “Service”), you hereby agree to be bound by all of the following terms and conditions (“Terms of Service” or “TOS”). All of the information, content and services (collectively, the “Content”) within this Service is protected by copyright © and other intellectual property laws. The Content is owned by iMBA Inc and its affiliated companies, licensors and suppliers. The Content is intended for personal use only. While you may interact with or download a single copy of any portion of the Content for your personal, non-commercial entertainment, information or use, you may not reproduce, sell, publish, distribute, modify, display, repost or otherwise use any portion of the Content in any other way or for any other purpose without the written consent of BUSINESS OF MEDICAL PRACTICE .com Requests regarding use of the Content for any purpose other than personal, non-commercial use should be directed to iMBA Inc, Suite #5901 Wilbanks Drive, Norcross, Georgia 30092-1141, USA [770.448.0769]. The Service’s forums, posts and comments are provided to give users an interesting and stimulating forum in which they can express their opinions and share their ideas. We do not endorse the accuracy or reliability of any advice, opinion, statement or information posted on these venues. Please use your best judgment and be respectful of other individuals using these features. Do not use vulgar, abusive or hateful language. You may not use the Service’s features for advertising or promotional materials or other forms of solicitation. Uploading copyrighted or other proprietary material of any kind on the Service without the express permission of the owner of that material is prohibited and may result in civil and/or criminal liability. Given the nature of the Service and the volume of messages and postings, we cannot and do not monitor all of the material posted or transmitted by users and third party information providers. While you agree that the Service will not be liable for such third party content, we reserves the right to modify, delete, move or edit any communications which they deem in their sole discretion to: violate of this agreement; be harmful to individuals or communities; obscene; defamatory; in violation of our or any third party’s rights; or otherwise unacceptable. By posting, commenting on or communicating with BUSINESS OF MEDICAL PRACTICE.com, you hereby grant us the royalty-free, perpetual, irrevocable, non-exclusive right and license to use, copy, modify, display, distribute and reproduce all such materials in any form, media, software or technology of any kind now existing or developed in the future. You also agree to indemnify, defend and hold us and/or iMBA, Inc harmless against any claims or costs, including attorney fees, arising from the use or distribution of those materials. You further grant us and our partners the right to use your name in connection with the reproduction or distribution of such material. 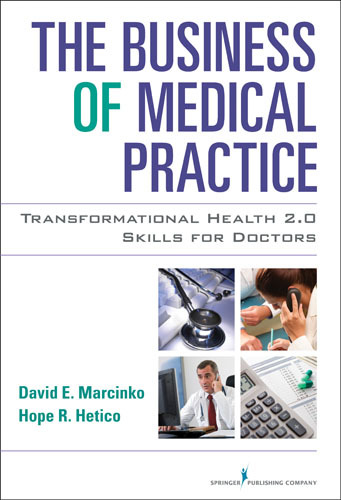 BUSINESS OF MEDICAL PRACTICE.com does accept unsolicited materials or ideas for use and/or publication in its programming or in other digital, electronic or print media except in connection with the features on the Service. We shall not be responsible for the similarity of any of its content or programming in any media to materials or ideas transmitted to the Service. The information provided in this service is supplied by the seller or third parties, and we cannot and does not verify or warrant the accuracy or completeness of the information. The service and materials contained herein are provided on an “as is” or “as available” basis and we make no representations or warranties, expressed or implied, to any person as to the accuracy or completeness of any information in this web site. You acknowledge that any reliance upon any such materials shall be at your sole risk. BUSINESS OF MEDICAL PRACTICE.com reserves the right, in its sole discretion, to correct any error or omission in any portion of the service or materials. Moreover, chapter topics, abstracts, verbiage, front matter and third edition posted, and printed, content matter is subject to change without notice. YOU EXPRESSLY AGREE THAT USE OF THE SERVICE IS AT YOUR OWN RISK. NEITHER BUSINESS OF MEDICAL PRACTICE.com, NOR ANY OF ITS EMPLOYEES, AGENTS, CONTENT PROVIDERS OR LICENSORS MAKES ANY REPRESENTATIONS OR WARRANTIES OF ANY KIND REGARDING THE SERVICE, THE CONTENT, ANY ADVERTISING MATERIAL OR THE RESULTS THAT MAY BE OBTAINED FROM USE OF THE SERVICE. THE SERVICE IS PROVIDED ON AN “AS IS” BASIS AND WE SPECIFICALLY DISCLAIM ANY EXPRESS OR IMPLIED WARRANTIES, INCLUDING WITHOUT LIMITATION, WARRANTIES OF FITNESS FOR A PARTICULAR PURPOSE, WARRANTIES OF MERCHANTABILITY OR WARRANTIES AGAINST INFRINGEMENT. BUSINESS OF MEDICAL PRACTICE.com, iMBA Inc, AND THEIR AFFILIATES, EMPLOYEES, AGENTS, CONTENT PROVIDERS AND LICENSORS SHALL IN NO EVENT BE LIABLE FOR ANY DAMAGES OR LOSSES, INCLUDING, WITHOUT LIMITATION, DIRECT, INDIRECT, CONSEQUENTIAL, SPECIAL, INCIDENTAL OR PUNITIVE DAMAGES, RESULTING FROM OR CAUSED BY THE SERVICE OR ITS CONTENT, INCLUDING, WITHOUT LIMITATION, LOSSES RELATED TO: YOUR USE OR INABILITY TO USE THE SERVICE; ANY ERRORS, OMISSIONS OR DEFECTS IN THE CONTENT; OR ANY INTERRUPTIONS, DELAYS IN TRANSMISSION OR COMPUTER VIRUSES. IN ANY EVENT, ANY LIABILITY OF BUSINESS OF MEDICAL PRACTICE.com, ITS EMPLOYEES, AGENTS, CONTENT PROVIDERS AND LICENSORS SHALL NOT EXCEED ZERO USDs PRIOR TO THE CLAIMED INJURY OR DAMAGE. The information presented on this site and in our book is believed to be factual and up-to-date, but we do not guarantee its accuracy and it should not be regarded as a complete analysis of the subjects discussed. All expressions of opinion reflect the judgment of the authors as of the date of publication and are subject to change. Information on this website does not involve the rendering of personalized business management, operational, financial or investment advice, but is limited to the dissemination of general information on products and services. A professional consultant or practice management advisor should be consulted before implementing any of the options presented. Macro and micro-economic factors, market conditions, and business strategies will affect the performance of any medical practice and there are no assurances that it will match or outperform any particular financial benchmark. The information contained on this website is general in nature. It is provided for informational purposes only, and should not be construed as managerial, legal, IT or tax advice. Always consult a professional regarding your specific practice situation. BUSINESS OF MEDICAL PRACTICE.com reserves the right change these Terms of Service without notice. Your continued use of the Service after the posting or modification of any amended Terms of Service shall constitute your agreement to be bound by any such changes. The Service may modify, suspend, discontinue or restrict the use of any portion of the Service, including the availability of any portion of the Content at any time, without notice or liability. These Terms of Service will be governed by and construed in accordance with the laws of the State of Georgia, without regard to its conflicts of law provisions. You hereby agree that any cause of action you may have with respect to the Service must be filed in the federal or state courts located in Gwinnett County, Georgia, within one year after the cause of action arises or the cause is barred. Dr. Charles F. Fenton III; FACFAS, Esq. Doctor – Are you Sharing too Much Online?